Follow these steps if your ride is important to you and you really want to prep the finish like the pros. 1. Show cars are never washed in a car wash, or even with a sponge in a soapy bucket of water. And you should always detail a car in a garage or under a carport; never in the wind or direct sun. 2. 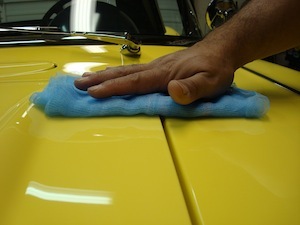 A sponge will leave light scratch marks, visible under low light, so use a tack cloth instead. 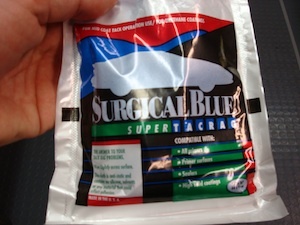 This surgical blue cloth is very tacky but will not leave a sticky residue like some products do. 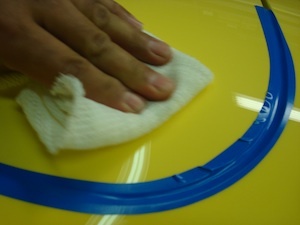 It is also ideal for cleaning prior to painting. 3. Open the package and refold the tack cloth so it is puffy, slightly larger than your hand. Then wipe down the car lightly to pick up the dust. 4. Take two or three long straight strokes using only light pressure. Let the cloth do the work. Refold the cloth as necessary to keep the dirt from scratching the surface. 5. 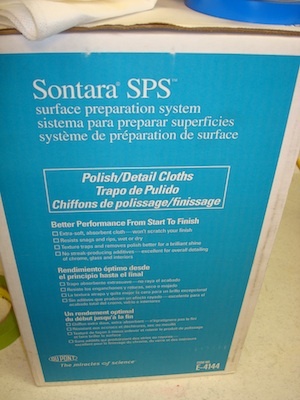 If there is too much dirt the Dupont E-4144 Sontera polishing cloths will work better. You can add water for better cleaning and they are disposable. 6. 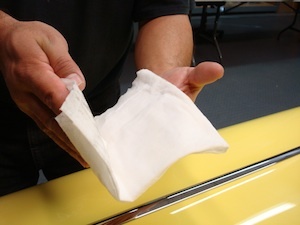 Fold three or four of the Dupont cloths together and dampen well. 7. Then squeeze out the excess water. 8. 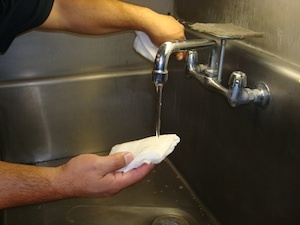 The cloth should not drip water, or it will leave water streaks. 9. 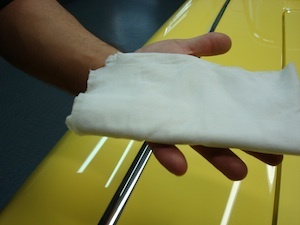 Use the wet cloth the same as the dry cloth. 10. The cloth will pick up the dirt. 11. Refold the cloth as needed to keep the surface clean. 12. 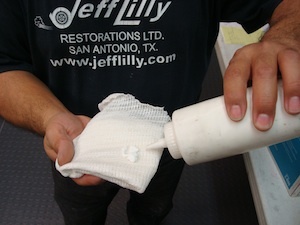 Never wash and reuse the cloth as that will scratch the finish. 13. After cleaning, the next step is to mask off all the emblems, moldings and body gaps to prevent the polish from getting stuck in crevices. 14. 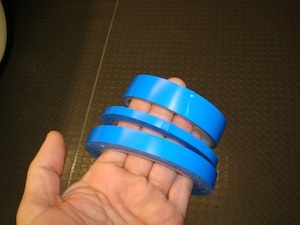 Lay the tape down with one hand as you push it into place with the other. 15. 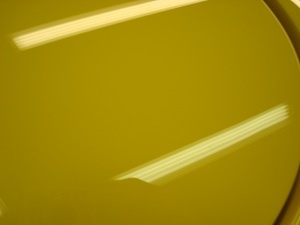 You can use any quality car wax you like however 3M 05990 is preferred for show cars. 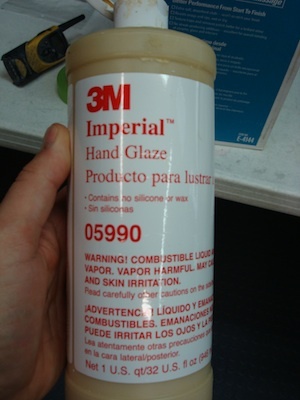 This product only lasts a few days but it leaves a superior finish and it does not contain silicone, which causes problems when repainting. It is also much easier to apply. 16. Regardless of the product, the application is the same. 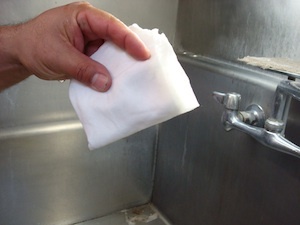 Squeeze a small amount of polish onto a clean tack cloth. 17. And then apply in a circular motion with minimal pressure. 18. 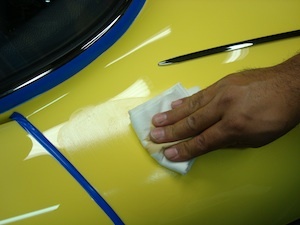 Let the polish sit until it turns dull and then wipe with a clean cloth until the residue is gone. 19. You can use Finesse It part #5929I to remove stubborn scratches and stains. 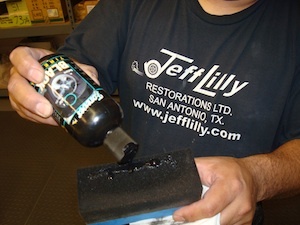 It might take a bit of rubbing but it is preferred to power buffing, unless you are a professional. 20. 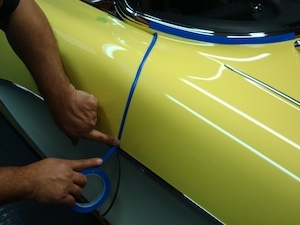 Finesse will take off the polish so you will have to re-polish the area when the scratch or stain is gone. 21. 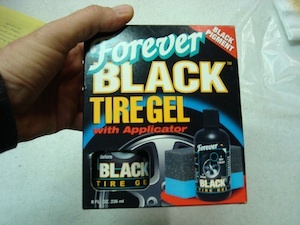 Use Forever Black on tires. 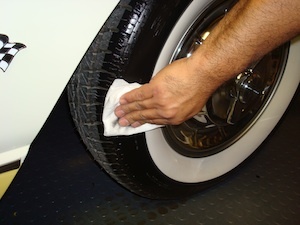 This product will make the tires look brand new without making them shiny or fake looking. 22. 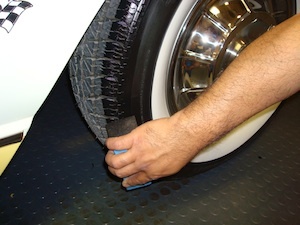 Start by cleaning the tire with a tack cloth. 23. 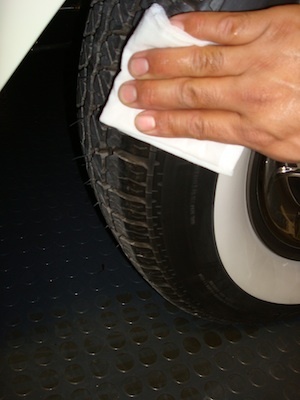 Use the disposable cloths with water and go just past the tread. For show cars, remove the tires, clean and blacken the tread and then wrap the tire in plastic until the vehicle is in place for the show. 24. 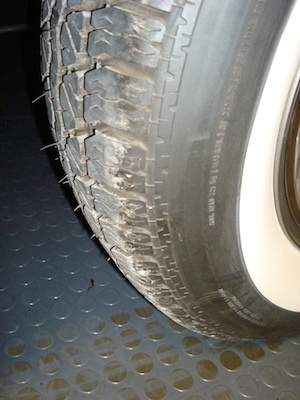 Apply the tire gel evenly and liberally. 25. 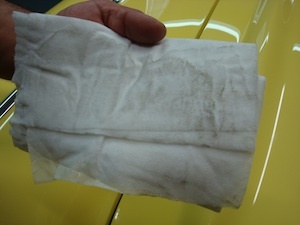 Then wipe with a dry rag to remove the residue. 26. And touch up as required.